That Thursday morning, I got a call from my counterpart, Jason, asking me to come and help the department in the afternoon’s activities. 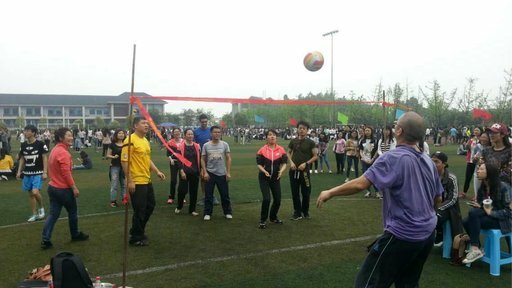 In China, every school — from primary to university — has a Sports Meet. You could call it field day, but that would seriously undersell the pomp and circumstance that surrounds the event. A better comparison might be if the Olympic Games were held at each university in America. Instead of delegates from different countries competing with each other, we had representatives from the faculty and students of each department. My counterparts participating in one of the events for Sports Meet. The department had to hit a volleyball back and forth over the net as many times as possible in five minutes. For the first time since coming to my university, I saw our little stadium, perched up on the mountain, filled with people. And on the track, participants began lining up behind signs which designated their department. I quickly found my own department and joined the ranks of my colleagues as we anxiously awaited the start of the event. The sky looked gray and heavy with rain. Everyone was shifting back and forth, frequently looking up at the sky and hoping the rain would hold off until the end of the events. Amidst a fierce wind and intermittent rain, the university president led the crowd in a patriotic rendition of the national anthem义勇军进行曲 Yìyǒngjūn Jìnxíngqǔ, or March of the Volunteers, before declaring the meet officially open. For weeks, my students had been ducking out of class in order to prepare for this competition. In huge blocks, they donned cheerleading uniforms, spaced themselves out across the football field and simultaneously danced their routines to the same song. It was great to see so many of my students performing. After the seemingly endless rounds of dance routines, my counterpart turned to me and said it was time for our relay race. I replied, “I don’t run.” He replied, “I think you can have a try.” And so it was decided. I would help my department run in a relay race. My colleagues and I preparing for our relay race. I was terribly nervous considering that I hadn’t so much as jogged since September. As the race began, my nerves continued to build. By the time it was my turn, I was almost shaking. I grabbed the baton and sprinted across the field. I heard the crowd gasp and then begin to roar. Not pausing enough to consider the reason for the reaction, I push forward, only trying to finish the race. After I crossed the line and passed the baton, I was able to catch my breath and realized that everyone was amazed at how fast I had run. That’s not to say I ran quickly — it only means that I exceeded the phenomenally low expectations that I had set. But in China, this kind of performance doesn’t go unnoticed. And so I was signed up to run another relay race for my department the following morning. Although I was happy to be included and my department was really excited to have me participate, I was legitimately concerned about my legs holding up for another 24 hours. By the time I lined up the next day, I was doing everything to distract myself from the pressures of the relay. I posed for pictures, chatted with my students and the other racers, and paced back and forth. And then it was time to run the race. As Jason sprinted forward, I started shaking again — the adrenaline coursing through my body. And then the moment was upon me. I grabbed the baton and powered forward. I passed the runner from the team next to me, and sprinted to catch up with the lead runner. And just like that, my part of the 4x100 relay was over. I eagerly watched my colleagues finish the race. Our anchor, Surprise, surged ahead and took the lead for good. We had won! And all of a sudden, I was recruited to run next year. 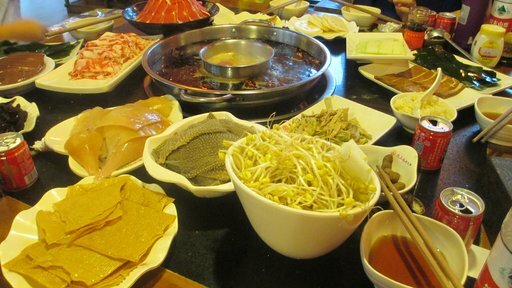 A traditional hot pot dinner. The rest of the day passed like a blur. As a department we competed in events like jump-roping, basketball lay-ups, volleyball setting and shot put. It was light-hearted and I had the opportunity to chat more with my coworkers. In between events, we joked around, snacked and watched our students participate in their own events. Sports Meet might have been a stressful few days, but it was so great to get to know my colleagues better. We are usually so busy during the semester that we really don’t have time to go out together. After the Sports Meet officially ended (my department took third place), we all headed to a hot pot dinner where I was introduced to more members of the department and many new foods. I got to know a little bit more about the people that I work with — where they’re from, what their families are like and how they came to be at the university. It was really amazing to find that there was this entire side to my community that I didn’t know. 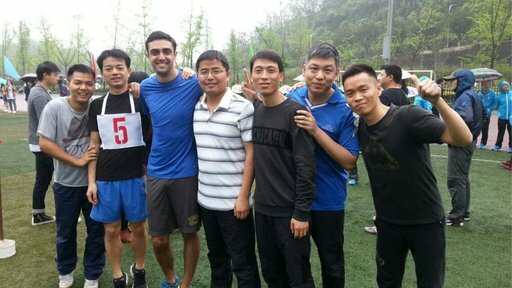 While I was certainly hesitant to take part in Sports Meet at first, I’m so glad that I accepted the invitation and learned a little bit more about my community, even if it means that there will be more relay races in my future. John Zeleznak is an education Volunteer in Peace Corps China.